I specifically remember spending a California Christmas at my grandparents’ apartment as a young boy. Walking through the courtyard, tossing pennies into the fountain, running my fingers and toes against the beveled and uneven pebble steps, the cast iron railings still warm from the West Coast sun. I got in trouble that year for dropping my first F-bomb. Off to the spare bedroom I stomped towards time-out. On the wall hung Hokusai’s famous The Great Wave off Kanagawa. And even as a child, I can’t forget standing on the pull-out mattress just staring into the structure, the color, and the simple grandeur of the cheap print kept inside a more expensive picture frame. 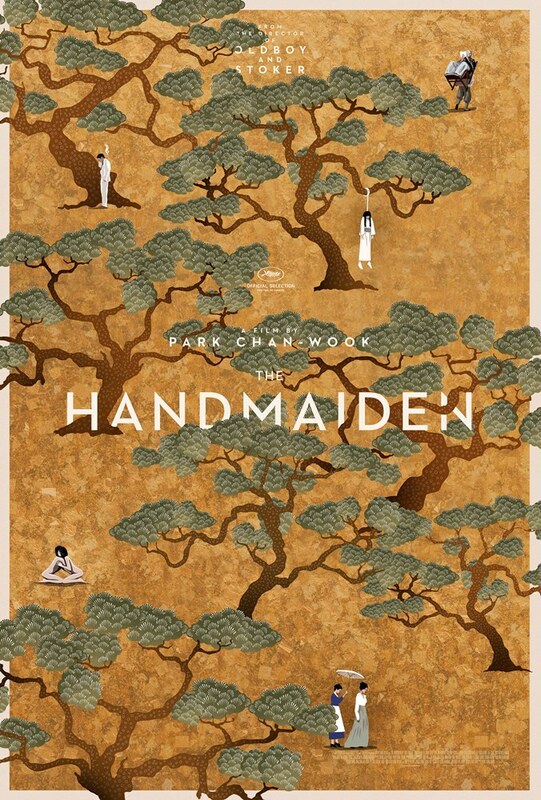 The Handmaiden, as beautiful and sinister as the painting’s crashing waves, evokes similarly drawn out pitches of reflection and delirium. The latest from the provocative South Korean auteur Park Chan-wook is as epic in its plotting and scale as it is taboo in its telling. I’ve seen many films. None really compare to this one. The mastery and the alchemy behind most of Park’s films is his unwillingness to keep the picture’s tone at an absolute standstill median. Instead he travels the law of averages from top to bottom, running from genre to genre in hopes of finding the mean within the lump sum, usually scissors in hand and donning a rapscallion grin. The technique always feel maniacal at first, especially if you’re not accustomed to or even anticipating what’s likely to come, but Park has enough sense and vision to return to the center at precisely the right moment. I imagine most genuine film scholars would be able to steer viewers towards The Handmaiden’s main influences. Good for them because I can’t, yet while it’s clear the movie is told under the umbrella of many, to me the film remained entirely its own microcosm. There can literally only be a few so-called “masters of cinema,” and if Park Chan-wook is to be seen as belonging to a lower tier, his filmography and track record are evidence enough that his days of immortality will soon become a foregone conclusion. For now we have to appreciate his individualized imitations. Few filmmakers are able to authorize their movies as entirely their own. Park is one of them. Mistress Hideko (Kim Min-hee) lives in an estate with her tormented Uncle Kouzuki (Jo Jin-woong). Some of the buildings represent the Japanese Edo period, others profoundly English, both sets quartered off and imprisoning. With these two, Park tells a disgusting, incestuous Disney fairy tale of despair. Hideko was orphaned and her Uncle wants her hand in marriage to gain the family fortune. But he’s also an undiluted and unabashed pervert as he professes, “I am a dirty old man who likes erotica.” Kouzuki’s plan has a hitch though; a charlatan under the nom de plume Count Fujiwara (Ha Jung-woo) knows of her wealth, wanting to marry Hideko then commit her to an asylum and keep the money for himself. Fujiwara executes this with the help of Sook-hee (Kim Tae-ri), a pickpocket raised in a house of con artists. She is to be Hideko’s maid, to lay the bait for Fujiwara to claim his bride. What he didn’t account for was the two women falling in love with each other. The Handmaiden gives off the same sort of impression as 2013’s Blue is the Warmest Color in its depiction of a queer relationship. Through smothered expressions of affection or brief moments of carnal intimacy and misandry – you can practically feel the heat from the screen, and as the camera tilts your head surely follows – Park’s film breaks barriers and translates to all languages because this sentiment is tied to the soul and not to the tongue. We get his expected twists, handing out clues but keeping the final result an enigma. And there are blood-stained scenes begging for a tourniquet. I’m still baffled by the fact that the film works so tremendously, that it can depict the extremes of love in such an archaic and tribal sense while weaving between genres like a Westminster champion. Park directs with visionary skill, the cast is exemplary, the cinematography by Chung Chung-hoon and the design by Ryu Seong-hie are both worthy of awards consideration. Nothing disappoints at any level. The Handmaiden tells its artful dodger story through a script drugged with truth serum, convincing us to submit to our most primal devices and divulge our most guarded secrets. This film wants to make you uncomfortable. Job well done.